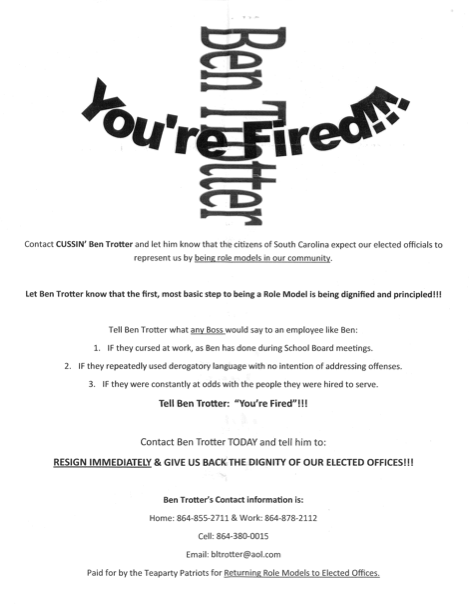 Conservatives Of The Upstate: Tea Party Not For Trotter? Really? 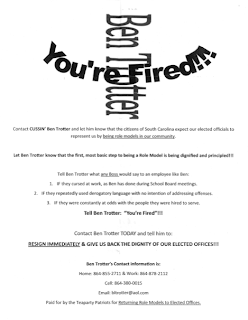 This is a copy of a letter that has been mailed and emailed across the school district regarding District 4 (Liberty Area) Schoolboard Trustee; Ben Trotter. Being a member or follower of every active truly Conservative group in the County … COTU members can vouch that no such "group" exists and that no Tea Party or Conservative group that we have spoken with agrees with or endorses this letter. All such groups deny or condemn any connection to this letter. Future Pickens County School District Superintendent; Kelly Pew is on record saying that "that's not how I remember him saying it." Ben Trotter has publicly denied saying the words. He has also called for an investigation on multiple occasions.